This meditation is for a Lenten devotional booklet for a Duke community. It was specifically to be related to the passage from John’s gospel and also to the 50th anniversary of matriculation of African-American students to Trinity College. We will link to the entire booklet once it is available. Employees, students, and faculty in solidarity for the dignity of work at Duke. 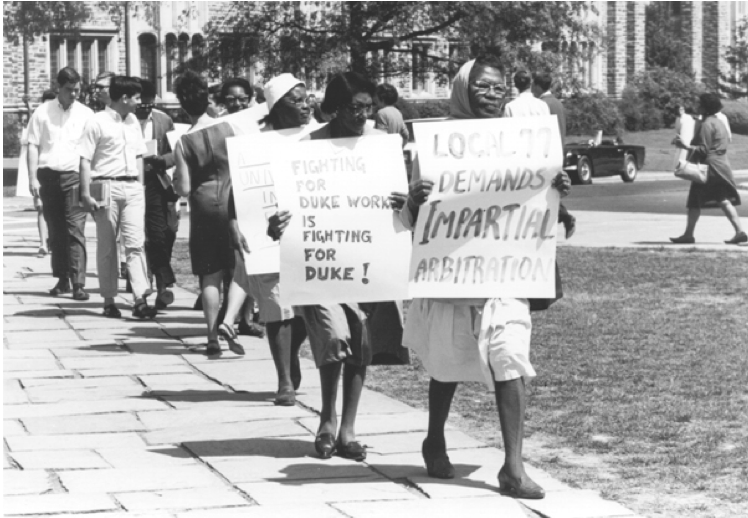 In front of the Duke Administration Building, April 19, 1967. Courtesy of Durham Civil Rights Heritage Project, Duke University Labor Organizing, 1961-1968, Durham County Library. Photograph by Bill Boyarsky. John 3:16 is tried and true. Apart from the 23rd Psalm, I would wager it is the best-known scrap of biblical knowledge in America. Its tried and true-ness may also tinge it as tired-out – as a too-readily recited word for a justice-starved world. But I cannot keep thirsting for justice without this truth about the Word who is Jesus Christ. Lent is a time for digging and sleuthing, for doing the archival work of the soul. This includes one’s own individual soul, and also the soul of a community, of a neighborhood, of a city, of a school. Lent is a time for uncovering the detailed mess of our history, and I recommend this discipline of memory right alongside the strange assurance that God means salvation for us. I do not know how else to suggest that someone fully reckon with the history of race at Duke without also signaling, like a simple sign on a back-country road: “For God so loved the world . . .” With this faith, I see this photograph as a call for repentance and encouragement. John 3:17-21 is a call to walk into the light, knowing that the bare, soul-searching work of memory is a practice of salvation, not condemnation. There is a profligate grace given through Jesus Christ, grace to uncover our sins. Prayer: Lord, not all our deeds have been done in God. Some of our back stories are too painful or too wicked or too cowardly to recall. I would rather shut my eyes. Lord, can’t we just move forward? Help me to know you mean to save me? Help me to feel your forgiveness, so that I can confess?